Three distinct subtypes of dendritic cells (DC) are present in mouse spleen, separable as CD4−8α−, CD4+8α−, and CD4−8α+ DC. We have tested whether these represent stages of development or activation within one DC lineage, or whether they represent separate DC lineages. All three DC subtypes appear relatively mature by many criteria, but all retain a capacity to phagocytose particulate material in vivo. Although further maturation or activation could be induced by bacterially derived stimuli, phagocytic capacity was retained, and no DC subtype was converted to the other. Continuous elimination of CD4+8− DC by Ab depletion had no effect on the levels of the other DC subtypes. Bromodeoxyuridine labeling experiments indicated that all three DC subtypes have a rapid turnover (half-life, 1.5–2.9 days) in the spleen, with none being the precursor of another. The three DC subtypes showed different kinetics of development from bone marrow precursors. The CD8α+ spleen DC, apparently the most mature, displayed an extremely rapid turnover based on bromodeoxyuridine uptake and the fastest generation from bone marrow precursors. In conclusion, the three splenic DC subtypes behave as rapidly turning over products of three independent developmental streams. Dendritic cells (DC)2 are sparsely distributed APCs of hemopoietic origin. They are specialized for the collection, transport, and processing of Ag and its eventual presentation to T lymphocytes. Such presentation of Ag on DC in the form of peptide-MHC complexes in conjunction with DC-associated costimulator and adhesion molecules is essential for initiating a primary T cell response. These specialized features have been extensively reviewed (1, 2, 3) and appear to be shared by all DC studied to date. However, despite these common biological functions, DC are found to be heterogeneous in surface phenotype, and at least some of these different subsets differ in developmental origin (4). There is increasing evidence that despite the common Ag-processing and T cell activation properties, some of the different DC subtypes confer different developmental fates on the T cells they activate (5, 6, 7, 8, 9). We are attempting to determine which DC subtypes represent the products of separate developmental lineages, as opposed to different activation or differentiation states within one common lineage. Recently, we found that the DC of mouse spleen can be separated into three distinct populations by employing surface markers more commonly used to segregate T cells, namely CD4 and CD8 (10). The surface staining of splenic DC for CD4 or CD8 was shown to represent authentic expression of these genes by the DC themselves, rather than pick-up of Ag from T cells or autofluorescence. This was an important issue, because the DC from other sources, such as the thymus, were found to be especially subject to artifacts of this type (10). The CD8, when expressed, was in the form of an αα homodimer; none of the DC populations expressed CD8β. The three spleen DC populations were shown to have the surface phenotype CD4+8−11b+205−, CD4−8−11b+205−, and CD4−8+11b−205+, respectively. The CD4+8− population could be further distinguished by the expression of moderate levels of F4/80 and by short term adherence to glass or plastic surfaces (10). All three populations were efficient at activating allogenic T cells into cell cycle in a conventional mixed leukocyte culture, so all populations met one basic criterion for classification as mature DC (10). Previous isolation procedures from both this and other laboratories had resulted in the selective loss of one or another of these splenic DC subsets, so their biological properties had not been fully evaluated and compared. Accordingly, in this study we examine the immediate developmental origin of the CD4+8−, CD4−8−, and CD4−8+ DC subsets of mouse spleen, asking about their relative maturation state, phagocytic ability, precursor-product relationships, and developmental kinetics. The results point to three separate developmental streams leading to three rapidly turning over DC subtypes. All mice were bred under specific pathogen-free conditions at The Walter and Eliza Hall Institute animal breeding facility. They were used at 5–7 wk of age unless otherwise stated. Most experiments used male mice of the C57BL/6J Wehi strain. For studies of the kinetics of development from bone marrow precursors the irradiated recipients were C57BL/6 Ly5.1 Pep3b mice, aged 8–10 wk. The CD4−/− C57BL/6 mice with the CD4 gene eliminated by homologous recombination were provided by Dr. W. Heath (The Walter and Eliza Hall Institute) and were originally obtained from Dr. T. Mak. The anti-CD4 transgenic mice of the BM-1 strain, expressing the GK1.5 anti-CD4 gene under the human CMV promoter, have been described previously (11). The recipient C57BL/6 Ly5.1 mice were gamma-irradiated with two doses of 5.5 Gy, 3 h apart. Total bone marrow cells from C57BL/6 (Ly5.2) mice were transferred i.v. (3–5 × 106 nucleated cells/recipient mouse) into groups of three irradiated recipients, which were pooled for isolation of spleen DC at the specified times after transfer. The progeny DC were detected on the basis of Ly5.2 expression in conjunction with the DC markers. Groups of eight mice were injected i.v. with either LPS from Escherichia coli (L3137, Sigma-Aldrich, Castle Hill, Australia) suspended in PBS (30 μg/mouse) or MPL (12) (provided by SmithKline Beecham, Rixensort, Belgium) suspended in a buffered salt solution (20 μg/mouse). In both cases the control mice were injected with the appropriate suspension medium only. The suspension medium had been tested and verified as endotoxin free. The mice were generally studied 18 h postinjection. Groups of eight mice were injected with 200 μl of 2.6% solid Fluoresbrite Carboxy YG 0.5-μm latex microspheres (Polysciences, Warrington, PA). Control mice were injected with the equivalent nonfluorescent latex microspheres from the same source. One, 18, or 42 h later DC were isolated side-by-side from the spleens of pooled test mice or the pooled control mice. During analysis the DC from the control mice were labeled with the same immunofluorescent reagents as the test mice and served as the background to assess fluorescent microsphere uptake. In some experiments 2.0-μm fluorescent latex microspheres from the same source were used in a similar manner. The procedure was performed as described recently (10, 13). Briefly, spleen fragments were digested for 20 min at room temperature with collagenase-DNase, then treated for 5 min with EDTA to disrupt T cell-DC complexes. All subsequent procedures were performed at 0–4°C in a divalent-metal free medium. Light density cells (<1.077 g/cm3 at mouse osmolarity) were selected by centrifugation in a Nycodenz (Nycomed Pharma AS, Oslo, Norway) medium. Cells not of DC lineage were depleted by incubating the cells with titrated levels of anti-CD3 (KT3), anti-Thy1 (T24/31.7), anti-B220 (RA3-6B2), anti-Gr-1 (RB6-8C5), and anti-erythrocyte (TER-119) Ab, then removing the Ab-binding cells with anti-rat Ig-coupled magnetic beads (Dynabeads, Dynal, Oslo, Norway). 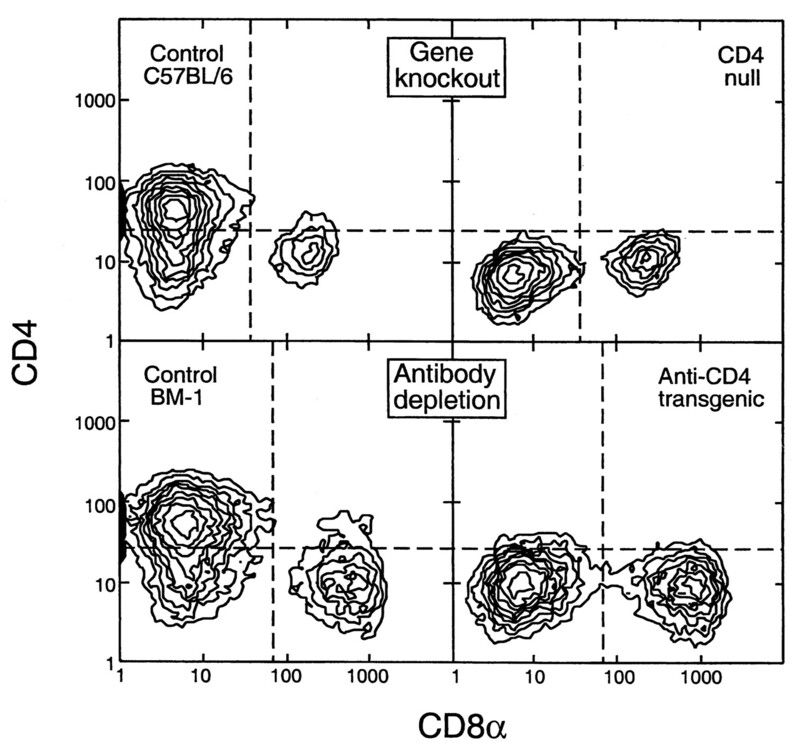 Note that anti-CD4, anti-F4/80, and graded levels of anti-CD11b Ab, used in earlier versions of the procedure (13), were all omitted from the depletion mix to avoid loss of the CD4+8− DC population (10). Note also that anti-B220 Ab, omitted in error from a previous description (10), was included. The splenic DC at this stage were usually about 80% pure. This preparation was then used for presorting when required or directly for immunofluorescent labeling before positive sorting or analysis. The DC preparation described above contained a variable (5–30%) level of autofluorescent cells that were not DC, but could contaminate a DC sample isolated by sorting based on immunofluorescent labeling (10). In most cases these were eliminated before immunofluorescent labeling by high speed presorting, using a MoFlo instrument (Cytomation, Fort Collins, CO) as described in detail previously (10). In some cases when the level of autofluorescent cells was only about 5%, they were rejected by gating for autofluorescence in an unused fluorescence channel during the positive sorting or analyses as described previously (10). The mAb, the fluorescent conjugates, and the multicolor labeling procedures have all been specified previously (10, 13, 14). To identify and sort all DC, the pan-DC markers used were high levels of class II MHC and/or CD11c. Anti-CD11c (N418) was used as Cy5, FITC, or PE conjugates. Anti-class II MHC (N22 or M5/114) was used as FITC, PE, Cy5, Texas Red, or Alexa 594 conjugates; the conjugation levels were deliberately less than maximal to ensure that the strong staining for class II MHC at saturation did not cause inaccurate color compensation problems in other channels. The markers used to separate the spleen DC subpopulations were CD8α and CD4. Anti-CD8α (YTS169.4) and anti-CD4 (GK1.5 or YTA3.1) (15, 16) were used as FITC, PE, Cy5, Alexa 594, or biotin conjugates. The staining for costimulator molecules employed anti-CD80 (16-10A1), anti-CD86 (GL1), and anti-CD40 (FGK45.5), used as FITC or biotin conjugates. The anti-Ly5.2 used for distinguishing the progeny of donor bone-marrow cells was AL1-4A2, used as an FITC conjugate. The second-stage stain for biotin-conjugated mAb was PE-streptavidin (PharMingen, San Diego, CA). Propidium iodide (PI) was included at 1 μg/ml in the final wash after immunofluorescent staining to label dead cells. As described previously (10, 13), most analyses and some sorting were performed on a FACStarPlus instrument (Becton Dickinson, San Jose, CA), using up to four fluorescent channels for the immunofluorescent staining (FL4 for FITC, FL2 for PE, FL3 for Cy5, and FL1 for Texas Red or Alexa 594), with the FL5 channel set to exclude PI-positive dead cells and autofluorescent cells. Care was taken during gating that any cells brightly fluorescent in FL3 and spilling over into FL5 were not gated out as dead cells. As well as the class II MHC and CD11c markers, the forward and side scatter gates were set to select for the light scatter characteristics of DC. For presorting and for sorting in up to three colors when large DC numbers were needed, the MoFlo instrument (Cytomation) was used. The procedure was similar to that developed for the labeling kinetics of T cells (17). Groups of eight mice were initially injected i.p. with 1 mg of BrdU (Sigma, St. Louis, MO) in saline to ensure immediate availability of the precursor, then continuously given BrdU (0.8 mg/ml) in sterile drinking water, which was changed daily. The DC were isolated and presorted to remove autofluorescent cells as described above. They were then surface stained as described above with either anti-CD11c or anti-class II MHC (Cy5 conjugate), anti-CD8α (PE conjugate), and anti-CD4 (Alexa 594 conjugate); PI staining was omitted. The DC were then stained for BrdU uptake as follows. The surface-stained DC were washed, resuspended in cold 0.15 M NaCl, and fixed by dropwise addition of cold 95% ethanol. They were incubated on ice for 30 min, washed with PBS, then incubated for 30 min at room temperature with PBS containing 1% paraformaldehyde and 0.01% Tween 20. They were pelleted, then incubated for 10 min at room temperature with 50 U of DNase I (Roche, Mannheim, Germany) in 0.15 M NaCl containing 4.2 mM MgCl2, then washed. They were then incubated for 30 min at room temperature with FITC-conjugated anti-BrdU mAb (Becton Dickinson), washed, and resuspended in PBS. The stained DC were then analyzed on the FACStarPlus flow cytometer (Becton Dickinson) for the number of FITC-positive (BrdU positive) cells in each gated DC subset. The FITC fluorescence distribution of BrdU-labeled cells showed only 3% overlap with the background in the FITC channel when analyzing DC subsets from non-BrdU-treated controls. DC preparations were stained with the following combinations to avoid background and autofluorescence problems postculture, which were minimal in the Cy5 channel: 1) anti-CD11c-PE, anti-CD8-Cy5, and anti-CD4-FITC; or 2) anti-CD11c-PE, anti-CD8-FITC, and anti-CD4-Cy5. A small sample of each was analyzed immediately using FACStarPlus (Becton Dickinson) and compared with unstained controls. 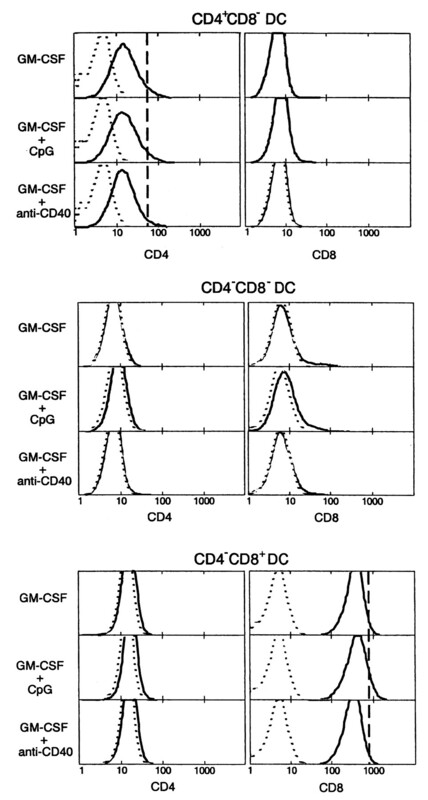 The bulk of each group was then separately sorted, using the MoFlo instrument (Cytomation), collecting from group 1 CD11c+ CD4− CD8+ DC and CD11c+ CD4− CD8− DC, and from group 2 CD11c+ CD4+ CD8− DC. Cells from each of the sorted groups were then incubated at 37°C for 16 h at 106 cells/ml in modified RPMI 1640 medium (13) containing either GM-CSF (100 U/ml) or GM-CSF plus CpG-DNA (oligonucleotide containing a CpG motif (18), phosphorothioate modified, synthesized by GeneWorks (Adelaide, Australia; 0.5 μM)) or GM-CSF plus a stimulatory anti-CD40 mAb (FGK45.5; 100 μg/ml). After incubation the DC were collected, and each sample was divided into two parts. One part was restained with the same reagent combinations used initially, and the other was not restained. All samples were then analyzed on the FACStarPlus, gating on viable (PI excluding) DC (CD11c+) and using the Cy5 channel to analyze CD4 or CD8 α expression. In a previous study (10) we distinguished three DC subtypes in mouse spleen, namely CD4+8α− DEC-205− CD11b+, CD4−8α− DEC-205− CD11b+, and CD4−8α+ DEC-205+ CD11b−. We showed that the CD4 and CD8 on the surface of these DC were genuine DC products and had not merely been picked up from associated T cells (10). The existence of these three DC subtypes is confirmed in the analysis of control spleen DC preparations, shown in Fig. 1⇓. In a separate study (data not shown) we have confirmed by immunofluorescent staining of spleen sections that the majority of these DC are located in the marginal zones of the spleen, with only the CD4−8+DC being concentrated in the T cell areas. An important issue was whether these DC subpopulations derive from separate developmental lineages or whether they are just maturation or activation stages of the one DC lineage. We had provided some evidence, but no formal proof, that the DC bearing CD8 have a different developmental origin from those that lack CD8 (19, 20, 21). The relationship of the CD4-bearing DC to the other DC subpopulations had not been examined. Accordingly, we first examined their relative maturation status. All three DC subpopulations could be classed as mature, because they were able to efficiently activate allogenic T cells into cell cycle (10) and because, as shown in Fig. 2⇓, they all expressed similar levels of CD40, CD80 (B7.1), and CD86 (B7.2) when freshly isolated from normal spleen. However the CD4−8+ DC could be considered more mature by some criteria, because some cells of this subpopulation expressed higher surface levels of class II MHC (Fig. 2⇓), and they were larger and showed more pronounced dendritic extensions on microscopic examination. Thus, it remained a possibility that some of the DC subsets simply reflected differences in the relative state of terminal DC activation or maturation. Accordingly, we tested the effect of various bacterially derived adjuvants that induce DC activation and maturation to determine whether one subpopulation could then be transformed into another. Bacterial LPS is known to induce DC maturation; it also causes a shift of DC from the marginal zones into the T cell areas of spleen, followed by DC death (22). Injection of LPS produced 18 h later a more mature or activated state in all three splenic DC subpopulations, as judged by increases in surface class II MHC, CD40, CD80, and particularly CD86 (Fig. 2⇓). There was a drop in the level of CD4 on the CD4+ cells recovered to the point where overlap with the CD4− DC was substantial together with a small drop in the CD8 level per CD8+cell recovered. Both the proportion and absolute number of CD4+8− and CD4−8+ DC were reduced (Table I⇓). However, the marked drop in DC recovery at this point made it more likely that most of the shift was due to the selective death of these subpopulations, rather than to complete down-regulation of CD4 or CD8 and transformation into a more mature CD4−8− DC form. Clearer results were obtained with injection of MPL, a less toxic derivative of LPS and used as an adjuvant (12). This also produced further activation of all DC subpopulations (Fig. 2⇓), but without any significant drop in overall DC recovery (Table I⇓). In this case, although there was a decrease in the level of CD4 and CD8 per cell, all three subpopulations defined by CD4 and CD8 expression remained present, and there was little evidence for transformation of one into another (Fig. 1⇓). The three subtypes of DC in mouse spleen and the influence of the adjuvant MPL. The control mice were injected with saline diluent only and showed a distribution identical with that of uninjected mice. MPL was injected i.v. 18 h before isolating the DC. DC were isolated side-by-side from pools of eight control or eight treated spleens and were stained for class II MHC, CD11c, CD4, and CD8α. The distribution of CD4 and CD8α is shown for gated class II MHChigh CD11c+ DC. Similar results were obtained in a repeat experiment. The total numbers of the three DC subtypes per spleen are given in Table I⇓. The levels of activation and maturation markers on splenic DC subtypes and the influence of bacterially derived adjuvants are shown. DC were isolated from pools of eight spleens from normal mice or mice injected 18 h previously with either LPS (A) or MPL (B). The DC were stained for class II MHC and combinations of the other markers. The distribution of class II MHC expression in the upper panels is for the entire enriched DC preparation, including any non-DC contaminants (5–25%). Note that the staining for class II MHC expression deliberately used a low conjugation ratio mAb to ensure that the high expression of class II MHC was on scale. The CD40, CD80, and CD86 expression is on the DC components only, gated for high class II MHC expression. The gray line is the background for control mice, omitting only the specific stain; the stimulated mice showed similar backgrounds. The full line is the fluorescence distribution for DC freshly isolated from control mice. The broken line is the fluorescence distribution 18 h after LPS or MPL injection. Overall, it appeared that 1) all three splenic DC subtypes were partially mature in normal mice; 2) all three subtypes could be further matured or activated by appropriate stimuli; and 3) there was no strong evidence that further maturation transformed one DC subtype into another despite reductions in the surface expression of CD4 and CD8α. A well-accepted model of DC maturation is that DC lose much of their capacity for phagocytosis of particulate and antigenic material when they migrate to lymphoid organs and develop the capacity to stimulate T cells. As a further test of the maturation state of the three splenic DC populations, fluoresceinated latex beads of two sizes as well as fluoresceinated protein and polysaccharide Ags were injected i.v. into mice. 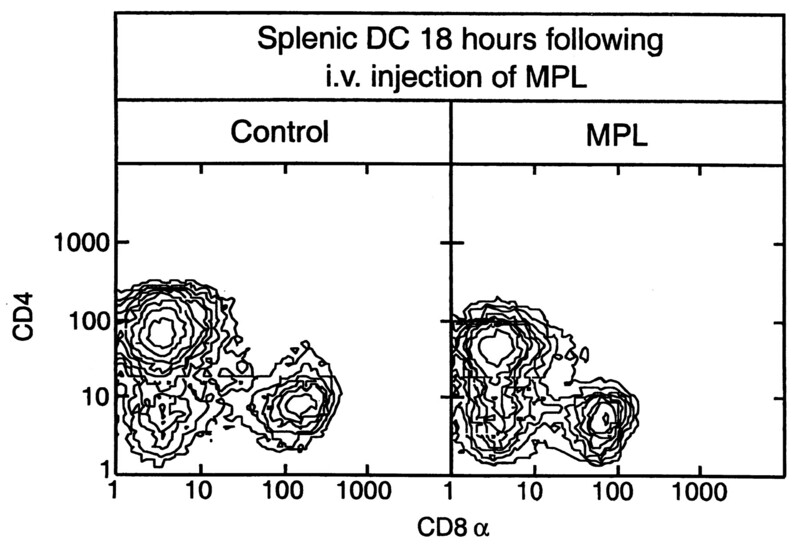 The entry of label into the three splenic DC populations 2, 18, and 24 h later was ascertained. As illustrated in Fig. 3⇓, a surprising high proportion of all three splenic DC populations showed a capacity to take up the 0.5-μm latex beads, at levels ranging from one to many beads per DC, within 2 h of injection. The CD4−8+ DC population showed the lowest proportion of phagocytic cells, but even here about 30% of the DC contained beads, and the number of beads per positive cell was similar to that in other DC. It was verified by fluorescence microscopy that the fluorescent beads were within the DC rather than simply adherent to the cell surface. Similar results were obtained with the larger 2-μm beads and with a range of protein and polysaccharide Ags (data not shown). In the case of the nondigestible fluorescent latex beads, the label persisted 18 h later (Fig. 3⇓). In the case of protein Ags, the label was markedly reduced at 18 h and was no longer detectable at 48 h (data not shown). The capacity of splenic DC subtypes to take up latex beads in vivo. Mice were injected i.v. with 0.5-μm latex beads, either nonfluorescent (background fluorescence distribution, broken line) or green fluorescent (heavy line), at 2 or 18 h before sacrifice. The beads were injected into normal mice (upper panels) or mice preinjected i.v. 1 h previously with LPS various times before sacrifice (lower panels). DC were isolated as side-by-side preparations from pools of eight spleens from fluorescent bead-injected or nonfluorescent bead-injected mice. 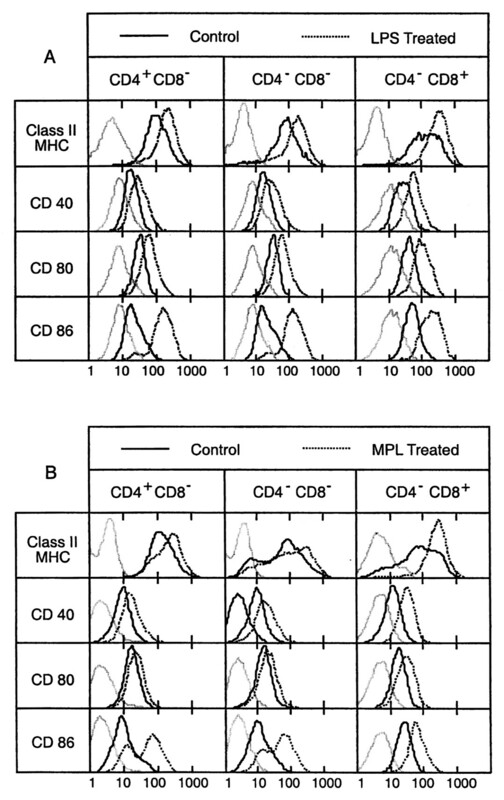 The DC were then surface stained for class II MHC and for CD4 and CD8α. The DC were gated or analyzed as class II MHChigh cells and divided into subpopulations by gating on CD4 and CD8α fluorescence. The fluorescence distribution due to bead uptake is shown for these gated subpopulations on a 4-decade log scale. Separate analysis of suspensions of fluorescent beads alone confirmed that the lowest positive fluorescence peak corresponded to cells showing uptake of a single bead. The percentage of DC showing uptake of one or more beads is given above the histograms. These results obtained in vivo were checked in vitro by isolating and sorting the three splenic DC subpopulations, incubating them at 37°C for 2 h with a suspension of the 0.5-μm latex beads, then washing away free beads and observing the cells under a fluorescence microscope. Under these conditions 8–10% of the DC had one or more latex beads adherent to the cell surface rather than internalized; this surface adherence was also detected by incubation at 4°C. This value was subtracted from the counts of DC showing uptake of beads at 37°C. The percentage of DC showing uptake of one or more fluorescent beads was: CD4+8− DC, 56%; CD4−8− DC, 41%; and CD4−8+ DC, 25%. Thus the in vitro studies largely confirmed the in vivo phagocytosis results. Because it was surprising that these relatively mature DC already within the spleen should still be capable of phagocytosis, LPS was administered to the mice to induce further DC maturation. This was expected to cause a reduction in DC phagocytic capacity. However, as illustrated in Fig. 3⇑, even the splenic DC of LPS-treated mice showed a remarkable capacity to ingest the fluorescent latex beads; the stimulant caused little change in the proportion showing bead uptake or the number of beads per cell. The same was found for fluorescent protein uptake (data not shown). In additional experiments the effect of MPL administration was similar to that of LPS. There were no marked differences among the three DC subpopulations in the effect of bacterially derived adjuvants on their capacity to ingest latex beads. Overall, all three splenic DC subtypes showed a capacity to ingest particulate material as well as antigenic proteins, and this ability persisted despite bacterially derived signals that promote further DC activation or maturation. There was no evidence from these experiments that the three DC subtypes represented sequential stages of DC maturation. A more direct test of possible precursor-product relationships among the three DC subpopulations would be first to separate them by fluorescence-activated cell sorting, then to transfer each population into an environment allowing further development. Our attempts to perform such experiments by reintroducing splenic DC subpopulations into the environment of a lymphoid organ have been unsuccessful to date due to poor reseeding back into the spleen following i.v. injection and to pick-up of surface Ags from thymocytes following direct injection into the thymus. However, it is possible to obtain further maturation of the isolated DC in short term culture before DC death intervenes; the presence of GM-CSF in the medium improves DC life span and recovery. Under these conditions the DC show changes akin to those seen in vivo on LPS or MPL injection, namely increased expression of class II MHC and of costimulator molecules; one difference is that CD80, rather than CD86, shows the most marked increase on culture (13). The effect of such terminal maturation during short term (overnight) culture on the CD4 or CD8 expression of the separated DC subtypes, either incubated with GM-CSF alone or with two effective activators of DC (the bacterial DNA motif CpG-DNA or stimulatory anti-CD40 mAb) is shown in Fig. 4⇓. Under these conditions DC recovery ranged from 60–80%; incubation longer than 1 day resulted in marked DC death, particularly within the CD4−8+ subpopulation. The expression of CD4 and CD8α by isolated spleen DC subtypes after culture. The three subtypes of spleen DC were isolated, stained, and sorted as described in detail in Materials and Methods. They were then cultured for 18 h in medium containing GM-CSF to maintain DC viability or with GM-CSF together with a stimulus known to activate or mature DC in culture. CpG is the stimulatory motif found in bacterial DNA, and anti-CD40 was a stimulatory anti-CD40 mAb. Separate cultures were used for CD4 and CD8 expression studies to avoid using fluorescent channels giving high background fluorescence after culture. CD4 fluorescence intensity was lower than usual, because of the need to avoid the high background PE or FITC channels. The broken line is the background fluorescence, and the heavy line is the stained cells, both postculture. The vertical broken line on the CD4 or CD8 staining histograms is the modal fluorescence for CD4 or CD8 on those DC when freshly isolated. The results are typical of the five experiments of this type. On incubation of the CD4+8− DC, no CD8 was expressed, and they remained CD4+8−, albeit with a marked drop in CD4 expression; in no experiments was this drop sufficient for the DC to be classed as CD4−, although when staining was less than optimal, the CD4− and CD4+ fluorescence distributions overlapped. When incubated for 2 days in culture, a point at which cell death complicated the interpretation, the recovered CD4+8− DC showed a further reduction in CD4 expression, but most of the cells would still be considered CD4+. On incubation of the CD4−8+ DC no CD4 was expressed, and they remained CD4−8+, with only a minor drop in CD8 expression (not always seen). On incubation the CD4−8− DC remained CD4−8−, with no significant acquisition of either marker. The same results were obtained when a range of other cytokines (TNF-α, IL-4, Flt-3 ligand, and combinations of these) was included in the culture medium along with GM-CSF. Overall, activating or maturing the splenic DC subpopulations in culture did not involve any measurable transformation between the CD4+8− and the CD4−8+ phenotypes or between the CD4−8− and CD4−8+ phenotypes. The relative stability of CD8 expression on culture is in line with our previous results (13). Although there was a marked reduction in CD4 expression by the CD4+8− DC in culture, most cells retained some CD4 expression, and no distinct subgroup of CD4−8− DC was generated. Our original expectation was that the new population of splenic CD4+8− DC, being adherent and expressing several monocyte/macrophage markers, would be the least mature form and would give rise eventually to CD4−8− DC or even to CD4−8+ DC. 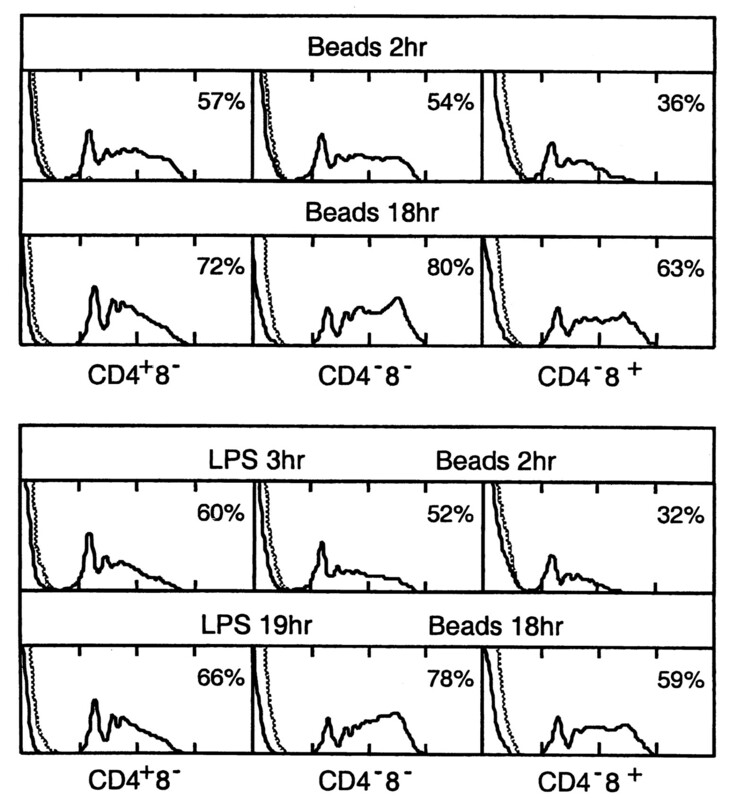 Although the forgoing studies did not entirely support this concept, the partial drop in CD4 surface expression on incubation or induced maturation left the possibility that a complete loss of CD4 might nevertheless occur normally in vivo. If CD4+8− DC were the obligatory precursors of other populations, elimination of this subset should prevent the development of the downstream DC forms. It was possible to test this using mice made transgenic for a depleting anti-mouse CD4 mAb, GK1.5 (11). This anti-CD4 mouse has been found to be selectively depleted of all peripheral CD4+ T cells (11). Therefore, the DC levels in the spleen of these continuously depleted mice was determined and compared with that in mice lacking CD4 because of elimination of the CD4 gene by homologous recombination. During analysis the DC were stained with an mAb, YTA3.1, that recognizes a different CD4 epitope to GK1.5 and is not blocked by GK1.5 (15, 16). The results are shown in Fig. 5⇓ and Table II⇓. The segregation of spleen DC by CD4 and CD8α expression in mice subjected to two forms of CD4 ablation. The mice were either CD4 null mice with the CD4 gene inactivated by homologous recombination or mice with peripheral CD4-bearing cells continuously eliminated because of expression of a transgene coding for an anti-mouse CD4 mAb. Both mice were compared with controls of the appropriate genetic background. Each result is typical of two analyses on pools of eight spleens. The absolute number of DC recovered in each category is given in Table II⇓. In the anti-CD4 transgenic mice the total splenic DC numbers were reduced to about half; this loss was largely due to the elimination of all detectable CD4-staining DC, with no significant change in the total levels of the CD4−8− or CD4−8+ subpopulations. Although some low level of the CD4+8− DC subpopulation might have persisted and been classified as CD4−8− DC because of capping-off of the CD4, the majority had been eliminated from the spleen without significantly affecting the levels of the other two subpopulations. This result was in contrast to the situation where the CD4 gene was ablated. In this case there was only a small drop in total DC numbers, no greater than the small drop in total spleen cellularity. The DC staining for CD4 were missing, but were compensated for by an increase in DC scoring as CD4−8− on analysis. Presumably the CD4+8− type of DC developed normally in these CD4 null mice, but because of the lack of CD4 expression, they were classified as CD4−8−. Overall, these results suggest that CD4 expression is not essential for the development of spleen DC and that the CD4+8− DC subtype is not a precursor of the splenic CD4−8− or CD4−8+ DC found in normal spleen. The rate of generation and the life span of the splenic DC populations had not been established, although there was evidence from a published study that CD8+ DC have a much longer life span than CD8− DC (23). We determined the rate of turnover of the three splenic DC subpopulations by following the kinetics of labeling of DC with the DNA precursor BrdU under conditions of continuous administration to mice. At various times after initiating BrdU administration, splenic DC were isolated, and the DC preparation was stained for class II MHC (to label all DC) and for CD4 and CD8α (to segregate the DC subtypes) and, after permeabilization, was stained with fluorescent anti-BrdU. The majority of BrdU-labeled DC could be readily distinguished from unlabeled DC, but because of a small overlap with the background fluorescence, a fully labeled DC population would score 97%, rather than 100%, BrdU positive. The labeling kinetics of the individual spleen DC subpopulations is summarized in Fig. 6⇓. The kinetics of BrdU labeling of the three DC subtypes from mouse spleen. Mice were injected i.p. with BrdU to initiate labeling, then were given BrdU continuously in the drinking water. At various times DC were isolated and surface stained for class II MHC, CD4, and CD8α, then were permeabilized and stained for BrdU incorporation into DNA. The BrdU fluorescence on the gated DC subtypes was measured and is presented as a percentage of those DC that were BrdU positive. BrdU fluorescence was well displaced from the background, but because of the 3% overlap with the background, a fully labeled population would score 97% positive. Each point is the mean ± range of two or three separate determinations on a pool of eight spleens. The point at time zero represents DC isolated 3 h postinjection of BrdU, when uptake would be into cycling cells and very little into their nondividing progeny. All DC subpopulations showed only a low level of BrdU-positive cells 2 h after BrdU administration, indicating that few of these DC were themselves in cell cycle. Therefore, most of the cell expansion to generate the BrdU-labeled DC that subsequently accumulated must have been within an earlier DC precursor population. This precursor may have been within the spleen but lacking mature DC characteristics or may have been in the blood or bone marrow. Therefore, the labeling kinetics of Fig. 6⇑ represents the entry of nondividing progeny cells into the splenic DC pool. It was notable that none of the spleen DC subpopulations showed any lag in BrdU labeling. A lag would be expected if one subpopulation was the product of another, as labeled DC progressively entered a single pathway consisting of sequential DC subtypes. Instead, all three subpopulations showed continuous and surprisingly rapid labeling, suggesting there were three independent streams of development, at least as far back as the dividing precursors. 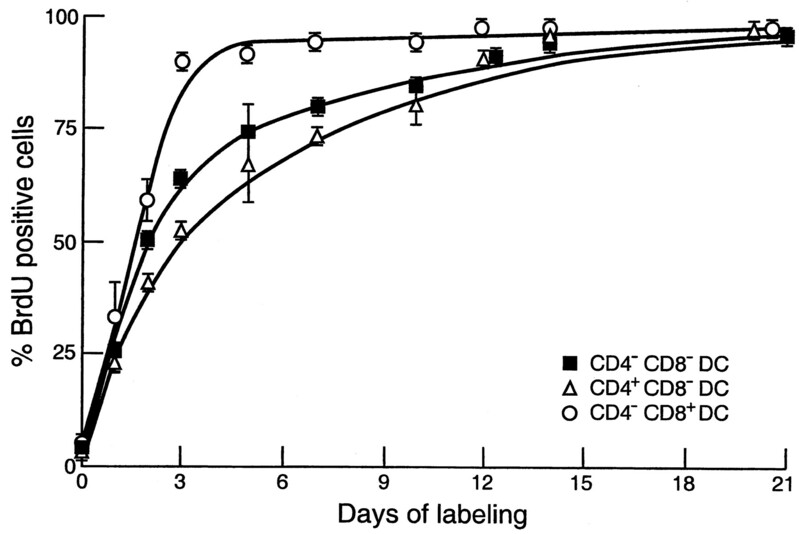 In contrast to expectations from published data (23) the CD4−8+ DC showed the fastest turnover (half-life, 1.5 days) with near-linear uniform labeling kinetics, so that almost all the CD4−8+ DC had been replenished by 3 days. The CD4−8− and CD4+8− DC had half-lives of 2.0 and 2.9 days, respectively, but with a nonlinear labeling curve, indicating that some of the DC of these populations had a longer residence in the spleen than the majority. The data in Fig. 6⇑ are from mice 5–7 wk of age. Older mice (20 wk) showed a 15–20% slower rate of DC turnover but with similar relative rates of labeling for the subpopulations. Even for older mice, this indicated a surprisingly rapid turnover rate for all spleen DC subtypes. Because LPS and MPL promoted DC maturation or activation and initiated DC movement into the T cell areas of spleen (22), we checked the effects of their administration to mice on the rate of spleen DC subpopulation turnover. A single critical time measurement (1 day) was chosen to compare with the turnover data in Fig. 6⇑; the results are given in Fig. 7⇓. LPS enhanced the labeling at 1 day of all DC subpopulations, but especially of the CD4−8+ subset. In view of the DC loss following LPS administration (Table I⇑), this result could have been due as much to selective elimination and death of the oldest DC as to enhanced DC production or entry into the spleen. 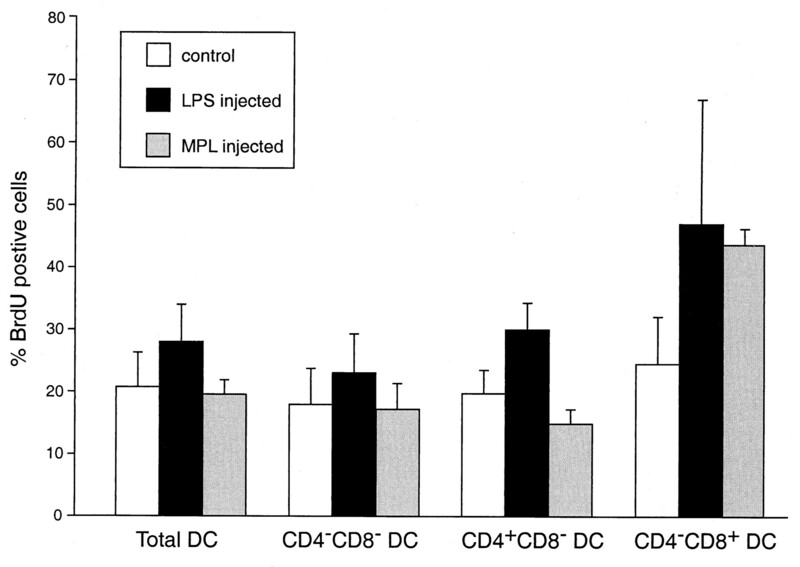 MPL had little effect on the labeling of CD4−8− and CD4+8− DC, but, like LPS, caused a marked increase in the labeling of CD4−8+ DC. Because MPL did not cause measurable DC loss at this time point, not even in the CD4−8+ subpopulation (Table I⇑), it appeared to promote genuine turnover, enhancing both entry and loss of CD4−8+ DC from the mature splenic DC compartment. The influence of LPS and MPL on the turnover rate of spleen DC subtypes. LPS and MPL were injected i.v. at the beginning of BrdU administration, and the DC were isolated and analyzed for BrdU uptake 1 day later. Results are the mean ± range of two or three determinations on pools of eight mouse spleens. The BrdU labeling kinetics shown in Fig. 6⇑ monitored the relative rates of DC subtype development from the point of entry of the label into the dividing DC precursors of unknown location. An alternative approach was to follow the relative rates of generation of the splenic DC subsets from precursors in bone marrow by transfer of bone marrow into irradiated recipients differing at the Ly5 locus. The precursors in bone marrow would include both multipotent hemopoietic stem cells giving long term DC reconstitution and more committed DC precursors giving faster, but transient, reconstitution. The results of such a study are shown in Fig. 8⇓. The kinetics of production of spleen DC subtypes from bone marrow precursors. Bone marrow cells (106) from C57BL/6 (Ly5.2) mice were transferred i.v. into irradiated Ly5.1 recipients. At various times thereafter groups of four recipient mice were used for spleen DC isolation. Each point is the mean ± SD of three experiments. The upper panel gives the absolute number of each DC subtype of donor origin per recipient spleen, and the lower panel is the relative distribution as a percentage of the total donor-derived DC. The transfer of bone marrow gave a rapid reconstitution of the splenic CD4−8+ DC, and these were the dominant progeny at early time points. After a peak at 2 wk the absolute yield of CD4−8+ DC progeny declined, suggesting that there had been an early wave of reconstitution from immediate, but transient, DC precursors. 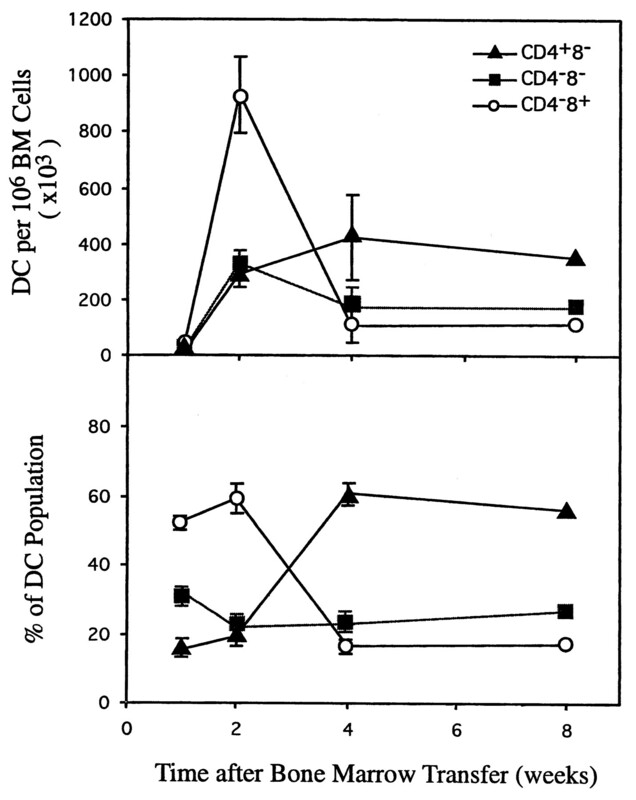 The CD4−8− DC gave peak reconstitution at 2 wk, but with a much less dramatic rise and fall than the CD8+ DC. The CD4+8− DC showed the slowest rate of reconstitution, peaking around 4 wk, at which time they were the dominant progeny. By 4 wk the subpopulation balance was similar to that in normal spleen, and this balance was then sustained, presumably by the long term hemopoietic stem cell precursors. Overall, the relative rate of DC subtype generation from bone marrow precursors was in line with the rate of turnover measured by BrdU labeling. Because three distinct subgroups of DC can be distinguished in mouse spleen (10), it was important to ask whether these represent distinct DC classes and products of separate developmental lineages or whether they are simply activation or maturation stages of what is basically a single DC class or lineage. We have previously argued, mainly by analogy with thymic DC and their earliest precursors, that the CD8+ DC of spleen may be a distinct subtype of lymphoid, rather than myeloid, origin (20); however, strict clonal evidence was lacking. The finding of a third new DC type, expressing CD4 (10), made re-examination of the origin of splenic DC more imperative. Therefore, we stepped back from our previous approach of segregating the earliest DC precursors and asked whether there was evidence for separate DC developmental streams at the later, rather than the earlier, stages of splenic DC generation. Several possible minimal models invoking only a single DC stream seemed possible. One preferred view was that the CD4+8− DC would be the least mature type, which on loss of CD4 would transform into CD4−8− DC and possibly also into CD4−8+ DC. The arguments for this were some similarities of these DC subtypes to monocytes and macrophages, including adherence properties and expression of CD11b and F4/80 (10). In addition, the partial loss of CD4 expression in culture or on stimulation by bacterially derived adjuvants in vivo encouraged the view that a complete loss of CD4 was possible. This model of the source of CD4−8− DC found in normal spleen was refuted by both the BrdU labeling kinetics and the bone marrow transfer studies. This indicated that CD4+8− DC had the slowest turnover in the spleen and that they were the slowest, rather than the fastest, to be generated following bone marrow transfer. Finally, the continuous and near complete elimination of CD4+8− DC in anti-CD4 transgenic mice without affecting the other DC subtypes was a strong argument against the view that expression of CD4 was an early step in the development of either CD4−8− DC or CD4+8− DC. A second view was that CD4−8− DC would be the least mature DC subtype and generate the others by acquisition of either CD4 or CD8α during further maturation. We consider that some form of immature DC must at some stage do just this, changing from CD4−8− to CD4+8− or CD4−8+. However, all the data we obtained from the BrdU labeling kinetics and from the forced maturation experiments indicate that the majority of CD4−8− DC in normal spleen are not immature DC, are not the direct precursors of the other subtypes, and cannot be induced to express either of these markers. They behave as a separate mature DC subtype. If anything, the results we obtained were the exact opposite of these expectations, with the one population that appeared marginally more mature, the CD4−8+ DC, being the first to be generated from bone marrow precursors and having the fastest turnover rate. However, we do not consider it likely that these were precursors of the other DC subtypes. There was no kinetic evidence from BrdU labeling that these served as precursors, and all the attempts at precursor-product analyses suggested only that they died faster, not that they produced other DC forms. A final possibility was that CD4 and CD8α are markers of no interpretive value, being randomly acquired on a single DC type by some functionally irrelevant process. However, the fact that the three DC subsets displayed differing and characteristic BrdU labeling and bone marrow reconstitution kinetics argues strongly against this, as does the published evidence of differences in biological function (4, 5, 6, 7, 8, 9). Current work from this laboratory (in preparation) indicates that each of these subsets secretes a different pattern of cytokines, strengthening the view that they are functionally distinct. Thus, the evidence to date, especially the lack of any obvious precursor to product labeling pattern in the BrdU labeling kinetics, points to the existence of three separate, independent DC developmental streams. It should be explained that the BrdU labeling data and induced maturation studies only make this point for the last steps of DC maturation, downstream from the last dividing DC precursor. This evidence does not extend back to the hemopoietic precursor cells and does not bear on the controversial issue of whether these DC subtypes are originally of myeloid or lymphoid precursor origin. However, the fact that our study of the rate of DC generation from bone marrow precursors also revealed very different generation kinetics for the different DC subtypes, in line with the BrdU labeling studies, does suggest the three distinct DC developmental streams extend back far enough to consider them different hemopoietic sublineages. In our current studies we are attempting to identify the bone marrow precursors of these separate sublineages. Two observations in this study appear to contradict the conventional views on DC maturation. The first is our finding that even the mature DC resident in the spleen retain a significant capacity for uptake of particulate material (even up to 2-μm diameter) and foreign molecules; this occurred even when further maturation was induced by bacterial products. It might have been argued that the uptake of the latex beads and the Ags had occurred while a less mature form of DC was in the bloodstream, and labeled DC only later seeded into the spleen and matured further. Against this is the finding that 30–70% of splenic DC showed uptake of beads and Ags within 2 h of injection, a period very much shorter than the rate of turnover of DC within the spleen. In addition, the DC populations isolated directly from the spleen showed a similar capacity to take up latex beads in culture. Leenen et al. (23) have also reported that DC within lymphoid organs retain phagocytic activity. In the latter case only the marginal zone DC (presumed CD8−) appeared phagocytic, whereas the DC in the T cell areas (presumed CD8+) did not, based on the loss of DC following i.v. injection of clodronate-loaded liposomes. We found that the CD8+ DC also showed a phagocytic ability for latex particles, although somewhat less than that of CD8−DC. One possible explanation for this difference is a reduced access of DC in the T cell zones to the i.v. injected liposomes in the Leenen et al. study (23). Another is that CD8+ DC may have an inherently low affinity for the liposomes they used. A third is that the CD8+ DC that showed uptake of the latex particles in our study were those outside the T cell area, although the finding of similar results after LPS injection makes this less likely. There are several studies that indicate that even mature DC retain some capacity to endocytose and process Ags (24, 25). Although it is doubtless true that the capacity of DC for phagocytosis and endocytosis drops during maturation, the conventional model seems overstated, because even relatively mature DC already situated in lymphoid organs are capable of significant uptake of foreign or particulate material. The second contradictory result was that the CD8+ DC have the shortest life span of any spleen DC subtype. This is in direct conflict with the conclusions of Leenen et al. (23), who followed the persistence of DC in transgenic mice with a conditional ablation of dividing DC precursors. They found the interdigitating DC in the T cell zones of mouse spleen (presumed to be the CD8+ DEC-205+ DC) persisted much longer than the DC found in the marginal zones (presumed to be the CD8−DEC-205− DC). This fitted with suggestions that CD8+ DC could be long term lymphoid tissue-resident DC with regulatory functions, such as presenting self-Ags and inducing self-Ag T cell tolerance (5, 6, 26, 27). In contrast we find the CD8+ DC have by far the shortest, rather than the longest, life span. We now question whether the conditional ablation system of Salomon et al. (28), as used by Leenen et al. (23), was functioning for splenic CD8+ DC as efficiently as it functioned for CD8− DC. This system requires the expression of a viral thymidine kinase in dividing cells, in this case dividing DC precursors, making them sensitive to ganciclovir, a nucleoside analogue. The survival of spleen T cell zone DC 7 days after ganciclovir administration may simply have reflected a poor expression of the enzyme in the separate precursors of the CD8+ DC lineage. Our data indicate that virtually all CD8+ DC and most other DC turn over within 3 days and so should have been eliminated by 7 days if the ablation of dividing DC precursors was effective. Regardless of the explanation of the earlier results, both our BrdU uptake approach and our studies on the rate of subset reconstitution by bone marrow precursors indicate that we must now reassess the immunological role of CD8+ DC in view of their exceptionally fast turnover. A point of general importance revealed in this study is the surprisingly rapid turnover of all DC subtypes in mouse spleen. Most resident DC were replaced within 3–4 days. We are currently assessing whether this is true of DC in other lymphoid tissues, such as lymph nodes, and whether it is true when DC interact with activated T cells. This result has important implications for the persistence of Ag presentation following an antigenic challenge. Clearly, the stabilization of the MHC-peptide complex on the surface of DC as DC mature (29, 30, 31) does not imply prolonged presentation of the antigenic peptide if the presenting DC itself has a very short life span. 2 Abbreviations used in this paper: DC, dendritic cells; MPL, monophosphoryl lipid A; PI, propidium iodide; BrdU, bromodeoxyuridine.